In the final chapter of my video on Newton’s third law of motion I explain the forces active on a rocket during launch. The forces which enable the rocket to launch are a result of Newton’s third law of motion and so it is important that they are clearly understood. This presented me with a challenge in designing the arrows which are used to represent the forces. Should they be solid? Three dimensional? What colour? How long? What shape? Solid? No. I wanted to use transparency to enable the rocket and flame of the rocket engine to show through. Three dimensional? Well this is an animated movie with 3D elements in it so yes I wanted three dimensional arrows. What colour? Sounds easy but I had to try various colours to get it just right. For example red clashed with the colour of the rocket and it was confusing to the viewer as to the direction of the arrow. That is not good for force arrows. Direction is everything when it comes to force vectors. Arrow length? Long arrows caused a problem with arrow overlap and again confusion. So I just needed to get the right balance for this. What shape? Well arrow shape sounds right. They are arrows after all. There are number of features in this image which took some time to get right. Do you see the lines running round the edges of the arrows? Well this required the use of a special material in Blender (this is the software I use to produce my videos). The material is a wire material and it gives a nice edge to the arrows which helps the person viewing the video to see the arrow shape during the camera movement. 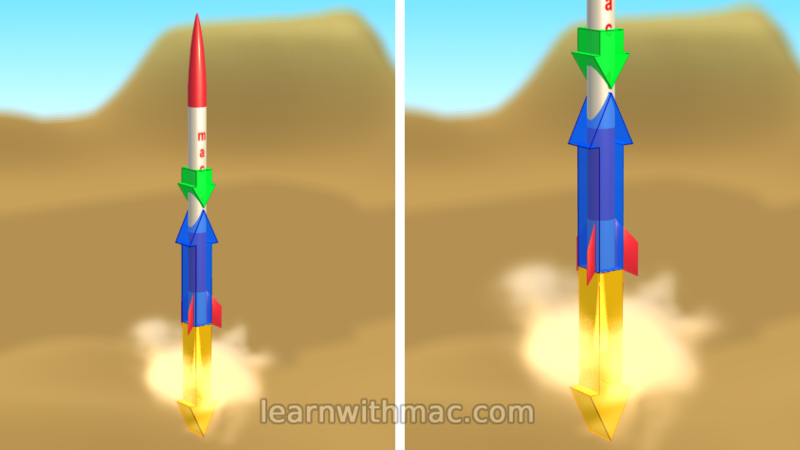 I also used depth of field to make the background out of focus to help the clarity of the arrows on the rocket. The glow on the yellow arrow is the hot exhaust gases as they leave the rocket engine. In the video the arrows dynamically change length in response to the magnitude of the forces on the rocket. All done with some noise modifiers on the animation curves for the arrow lengths. Blender is amazingly powerful enabling you to create some great effects using a combination of features. Ah well, you will need to watch the video to find out. Thank you very much professor Mac for your wonderful explanations. In the secondary school,i was not very clear with Newtons laws of motion,especially the third law but now i do. Thanks for your feedback Apuri.